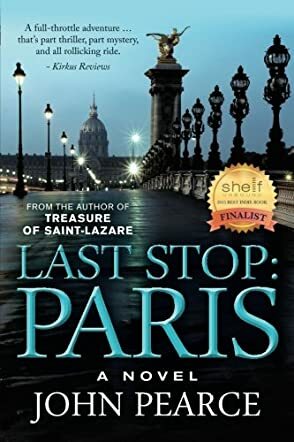 Last Stop: Paris by John Pearce is the thrilling sequel to Treasure of Saint-Lazare. Ex-soldier Eddie Grant is just starting his life over in France with his beautiful fiancée, Aurelie. As a favor to a friend in the CIA, Eddie and Aurelie attend a banker's party in Paris. Excusing themselves from the party early, they plan to meet some friends at a small cafe within walking distance. On the way, they witness a man thrown from Aurelie's rental apartment. Suddenly, Eddie and Aurelie are flung into the middle of a conspiracy that spans several years. As they become more involved in the plot, Eddie's happiness is threatened when his old flame, Jen, appears, asking for his help. Through her, he finds out that the elusive man he is after is the same man that killed his family a few years ago. Can Eddie focus on the present and stay true to Aurelie? Or will he succumb to Jen's seductive charms and their recent past? Things heat up when Aurelie disappears and they discover what the abductors really want: Eddie. Last Stop: Paris by John Pearce was a fast paced book set in various, richly described locations in Europe. Although it's the second installment in The Eddie Grant Series, I didn't have difficulty following what had happened in the first book, Treasure of Saint-Lazare. I loved that the reader is thrown into the story immediately and the action just keeps going to the last pages. Last Stop: Paris is filled with action, political espionage, and a murderous vendetta carried out by one of the world's most elusive and richest men. A fascinating book and a great sequel. I would suggest Last Stop: Paris to those that enjoy action, thrillers, espionage, and seeing politics from a different vantage point. A great thriller by John Pearce. The book was awesome!